This cookie is unbelievable! It’s a new take on a classic dessert! Pair it with ice cream or milk and you’re in heaven! I used a skillet chocolate chip cookie recipe from Lodge as a guide. Their recipe calls for a 10 inch skillet and I have a 12 inch. So I added 1/4 to every ingredient (i.e. it called for 1 cup flour I used 1 and 1/4 cup flour). I also had to adjust the cooking time a little. I baked it for 20 minutes on 375, but was worried the top was getting too browned while the inside was still gooey, so I decreased the heat to 350 and baked for another 10 minutes. In a large bowl, beat both sugars and butter until smooth. Add the vanilla and eggs one at a time, beating well. Add the flour, baking soda, and salt, stir well. Spray 12 inch cast iron skillet with cooking spray. 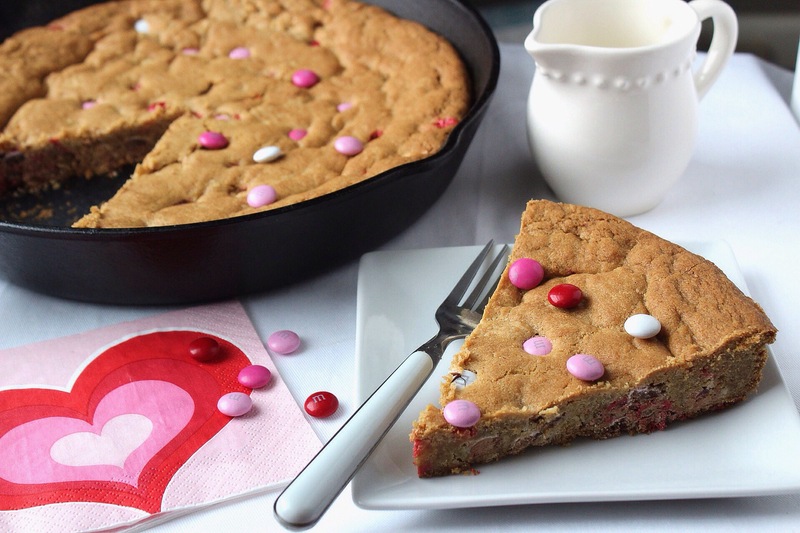 Pat the cookie dough evenly into the skillet. Bake around 20 minutes on 375, turn down to 350 and bake for another 10 minutes. Remove skillet from oven and let cool on wire rack for 15 minutes. Cut into even wedges and serve.